What is a Kit of the Month? Not to be confused with the Workshop on the Go Kit that consultants do monthly, the Kit of the Month is when I take a Close To My Heart Level 1 scrapbooking kit and design four pages with the supplies which include four base pages, two sheets of pattern paper, two sheets of cardstock and two sheets of thick, cardstock stickers. Then I provide easy-to-follow cutting guides and photos along with helpful tips for assembly. In other words, YOU don't have to think. I do that for you. 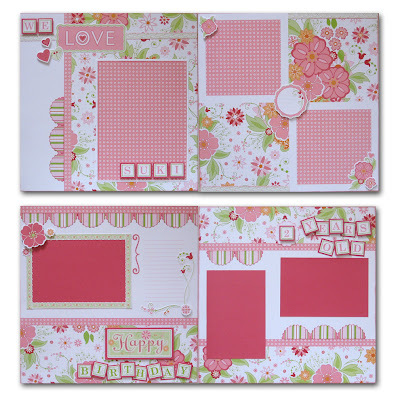 It's full of pinks and greens and it's beautifully girly. (If you'd like to view the photo in more detail, simply click on it.) I can't wait to put Suki's photos on these pages. She's a pretty girl and her pretty face will look great with these papers. If you're an existing customer of mine, you already know you can order the Kit of the Month from me anytime. It's not a club, it's not a commitment. If you like it, you buy it. I design one each month with a new Level 1 kit. If you're not an existing customer and would like to get the Sophia Kit of the Month, you can buy it now with the Pay Pal option below for $17.00 including U.S. shipping & tax. Suki Card; All stamps are NOT created equal! Double Winnings in One Week! WOW! Frugal Friday Coaster Card & A Winner!